What is Spread Betting and How Does it Work? Spread betting is a tax free* and cost effective alternative to traditional share trading. It allows investors to take a view on the movement of a wide range of global markets. Because investors use a spread trading company and not a broker, they do not have to pay any commissions or broker's fees. Financial Spreads offers +1,000 markets and investors are not restricted to speculating on shares, they can take a view on the forex markets, stock market indices like the FTSE 100 as well as commodities like gold, silver and crude oil. Financial Spreads make a 'spread' based on the live, underlying market. Investors can speculate on whether the market will rise or fall. The 'spread' in the phrase Spread Trading refers to the Sell (Bid) and Buy (Offer) price quoted by a spread trading firm. Clients should be aware that Financial Spreads is not a stockbroker and therefore we do not charge clients commissions or brokers' fees. Instead Financial Spreads makes a profit from the 'spread' that we add to the underlying market. The spread is calculated by taking the live (or the estimated future) market price of a given financial market. E.g. if the Daily FTSE 100 market is trading at 6830 then the Financial Spreads quote might be 6829.5 - 6830.5. Depending upon the market in question, with Financial Spreads, investors may only need to make a small deposit in order to open a new position, e.g. you only need a deposit as small as £30-£40 for a £1 per point trade on the FTSE 100. Once an investor has chosen the market they want to trade they can then choose how much they want to stake. The stake will represent the profit/loss per point of movement of that market. Note that each market has its own individual maximum stake. The investor also chooses to speculate on whether they think the market will rise or fall. If they are right, they will make a profit of 'the stake multiplied by each point that the market moves in their favour'. If they are wrong then they will make a loss of 'the stake multiplied by each point that the market moves against them'. Be aware that losses can quickly increase should the market move substantially in the opposite direction of your position, e.g. if you make a down trade on the Germany 30 index and the market moves up instead of down. All spread trading profits are free of Capital Gains, Stamp Duty and Income Tax*. 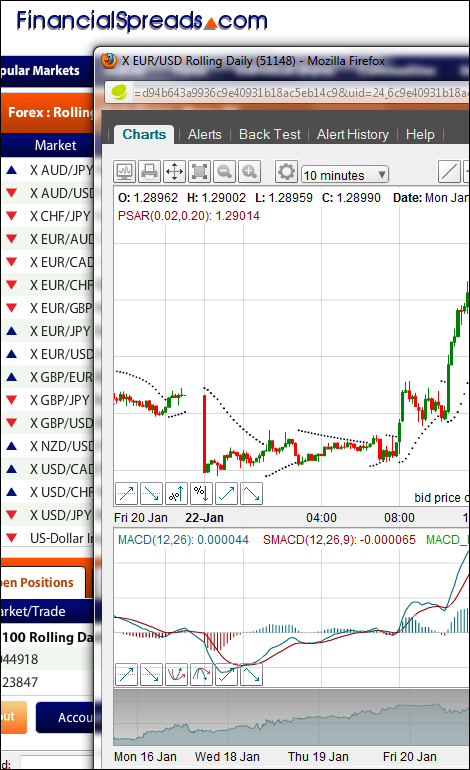 If you are new to spread trading, then we recommend that you try our free online Demo Account. The Financial Spreads Demo Account mirrors the live trading system, apart from the need to deposit funds. Investors can place demo trades with virtual funds and use features such as the charts and various trading orders. Used in conjunction with the Beginners Guide to Spread Trading, investors can get to grips with the basics of spread trading and/or familiarise themselves with the Financial Spreads platform before live trading (trading with real money). With spread trading, investors are able to speculate on a huge variety of financial markets from one account and in one currency. With Financial Spreads, clients make trades in one of three currencies (sterling, euros or dollars). This means that clients do not have to bother with expensive exchange rates. In general, clients can trade in their own currency. Spread trading is a margined product, this means that investors only need to deposit a small percentage of the full value of their trade. This lets investors use their excess capital to work elsewhere for them. As an example, a £1 trade on a share is the equivalent of buying (or selling) 100 real shares. With most shares the Financial Spreads minimum Initial Margin Requirement (deposit) is around 3-5% of the underlying value of the shares. Therefore clients can take a position on a particular share with as little as 1/30th of the money required to buy the real shares via a stockbroker. Also, don't forget that UK residents have an added benefit, spread trading profits are exempt from Capital Gains and Income Tax*. Whilst spread trading offers many benefits, it is important to note that it also carries a high level of risk to your funds. Investors should only trade with money that they can afford to lose. To help with risk management, Financial Spreads adds compulsory Stop Loss orders to each trade. For more details also see Risk Warning. Bull or Bear Markets - one clear advantage with spread trading is that it offers the opportunity to short (sell) a market. This means that investors can take a position on a market to drop as well as rise. No Commission and No Brokers' Fees - because Financial Spreads is not a stockbroker, we do not charge clients commission or brokers' fees. The only 'fee' charged is already priced into the spread on the quoted price. If you choose to keep any 'rolling daily' spread bets (or daily CFD trades) open overnight then you might incur a small overnight financing fee. Likewise, if you choose to apply a Guaranteed Stop to your trades then you'll be charged a small premium. Gearing - spread trading lets investors trade in sizes smaller than those usually available in the underlying market. Likewise, investors can also benefit from the opportunity to trade in larger positions than are often permitted in the underlying market and without depositing a large amount of capital. Tax Free Profits* - in the UK spread trading profits are exempt from Income Tax and Capital Gains Tax. Trades are also exempt from Stamp Duty. Tight Spreads - at Financial Spreads we aim to offer low-cost trading as well as a high quality service. Investors will find that our spread quotes are often better value than most of our competitors. In a number of cases, investors will find that our prices are extremely competitive in relation to the underlying, live market prices. Limit your Risk - Spread trading is a high risk form of speculating, nevertheless at Financial Spreads we want you to have a positive trading experience. Therefore, we have an automated Stop Loss facility in order to help traders with their risk management. 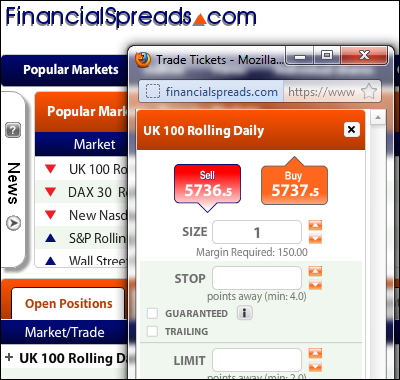 As an example, our Rolling Daily FTSE 100 spread is just 1 point, as is our Rolling Daily market for euro/dollar, dollar/yen and euro/sterling. In short, we add a Stop Loss order to all trades and therefore should the market move against your position, and cross a pre-defined level, the Stop Loss order will close your trade in order to prevent any further losses. A Stop Loss order is automatically set according to the funds available on your account. Nevertheless, you can, funds permitting, amend a Stop Loss level to suit your needs. Clients should be aware that we also hold an additional 20% of your funds to allow for slippage or a market gap. It is important to note that these normal Stop Loss orders are not guaranteed, the market could gap in which case your position would be closed at the next traded level. Having said that, clients Depending upon the market in question, with Financial Spreads, investors may only need to make a small deposit in order to open a new position, e.g. you only need a deposit as small as £30-£40 for a £1 per point rade on the FTSE 100. Once an investor has chosen the market they want to trade they can then choose how much they wan can also add Guaranteed Stop orders to trades. Guaranteed Stop orders work like a normal Stop Loss and come at a small premium however they are guaranteed to close your trade at the level specified, even if the market gaps. Although it possible to make substantial profits with spread trading, if the markets move against you then your losses could also become substantial. Whilst Financial Spreads has a policy of trying to limit your losses by adding automatic Stop Loss orders to each trade, as mentioned above, these stops are not guaranteed. As such, if a market gaps, you could lose more than you allowed for. 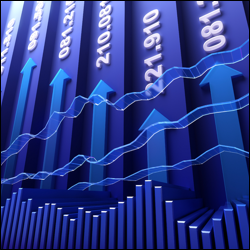 Why Should I Consider Spread Betting? Spread trading appeals to a wide array of individuals who are looking to take advantage of the versatility and low cost trading that spread trading can offer. Many individuals who are new to spread trading use technical analysis to guide their decision making process. 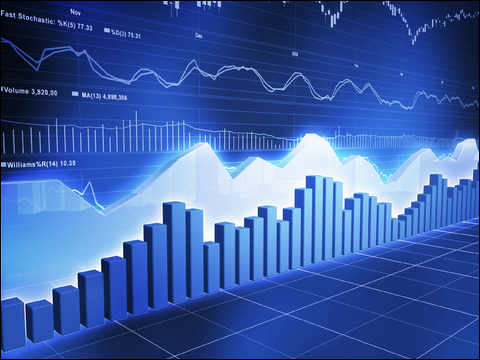 Financial Spreads provides charts for every market that we quote in order to help clients with their technical analysis. Experienced traders often use spread trading as an additional investment tool as the prices that Financial Spreads offers often rivals the prices available in the real underlying market. Not only that but many investors use this form of trading to hedge their existing equity portfolio. For example, if a client has some shares which are decreasing in value in the short-term, they could "Sell" the same market using a sell trade with Financial Spreads. As such they could potentially make a profit to counteract the decreasing value of their shares. Whilst you do not need to be an experienced investor to start spread trading you must ensure that you fully research the products that you are looking to trade and also be aware of the risks associated with spread trading.